I will forever remember this recipe as the jam that was so easy to make — I made it while packing up my apartment to move. In fact, this Instant Pot Blueberry Jam may be the easiest thing I've ever pressure cooked! I peeked in at it every so often, gave it a stir, and then went back to taping boxes while it puffed and sputtered away in the background. And bonus — it made the apartment smell like a confectionery! Pressure cooker jam requires only 2 ingredients (fruit of choice + honey), and 5 basic steps. Boil again until it gels! Does it get any more low maintenance than that?! And because the honey thickens up nicely when boiled, there's no pectin involved! I've used this recipe as a formula for strawberry jam (as I demonstrate on video in our Pressure Cooking eCourse) and peach jam as well. In the future, I'm excited to branch out and try cherry jam, plum jam, blackberry jam — you name it! 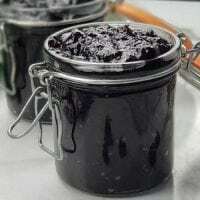 This Instant Pot Blueberry Jam may be the easiest thing I've ever pressure cooked! It requires only 2 ingredients (fruit of choice + honey), and 5 basic steps. And because the honey thickens up nicely when boiled, there's no pectin involved! Add blueberries to inner pot of pressure cooker. Put pressure cooker on low heat (Keep Warm function if using Instant Pot or other electric cooker) until honey melts. If using frozen berries, this part may take a while, but don't worry. It's worth it! When melted, turn pressure cooker to high heat (Saute function on Instant Pot) until honey boils. There will be white-pink bubbles all around the blueberries. When it boils, quickly put on the lid of your cooker, checking that the seals and all components are in good shape, including being in the sealing position. If using an electric cooker, hit the Cancel button, then set to high for 2 minutes. If using a stovetop cooker, bring to high pressure and maintain pressure for a cook time of 2 minutes. When cooking time is over, if using an electric cooker, hit the Cancel button to turn off the heat, and unplug. With a stovetop cooker, remove from heat. When depressurized, remove lid and turn pressure cooker back on to high heat (Saute function on Instant Pot). Let boil until some of the water has evaporated off, and the jam is nice and gelled when dripped off a spoon. Make sure to scrape the bottom frequently to ensure even gelling. Pour jam into clean half-pint jars. *If adapting this recipe to another fruit, keep in mind whether it will need to be cut into smaller pieces, de-stemmed, or peeled. *If freezing fruit to use for jam later on, make sure to freeze it ready-for-use, or else it'll be a hassle later on! *If fruit has been frozen into bigger chunks (such as peaches), simply pressure cook for 3 minutes instead of 2, and then mash with a potato masher to get a smoother consistency. *Also, feel free to play with the timing of the final boiling step. If your fruit is more watery (such as peaches), let the liquid reduce for longer. *The beauty of this recipe is its versatility! Tweak the type of fruit, the size of your fruit chunks/slices, or how long you boil the jam at the end. Combine fruits for a unique jam combo. The possibilities are endless. Enjoy! Have you made jam in the pressure cooker? 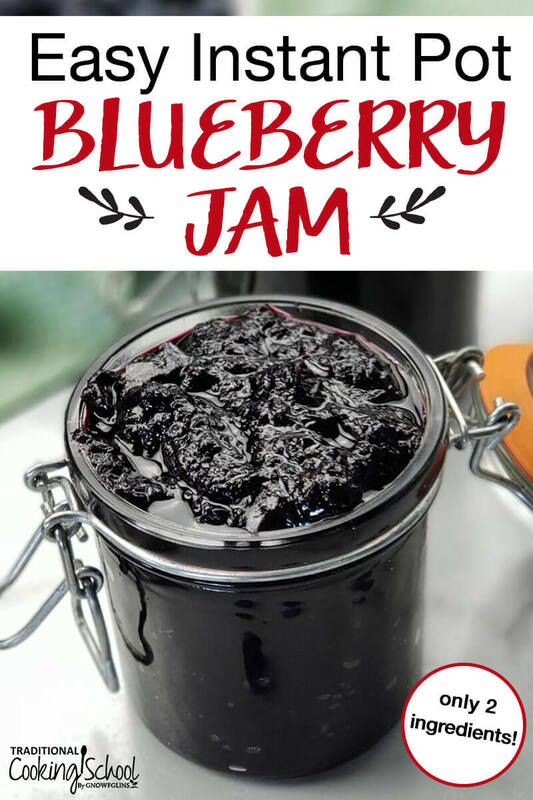 What do you think of this Easy Instant Pot Blueberry Jam? This post featured in 60 Easy & Nourishing Picnic Recipes. Looks yummy and so easy. How long does the jam stay good for in the fridge? That’s great,Is it butter or cream cheese on the ? with the blueberry jam picture ? ? Thanks ! in advance ? This looks delicious and much simpler than I had feared. 🙂 A couple of questions – where do we remove the Instant Pot lid again and replace it again? Once it has depressurized, do we remove the lid before turning to Saute again so we can boil and stir the jam? Also, can we safely use one or two larger jars rather than the small half-pint ones? Thanks much! Larger jars should be fine. None of the jars actually go through the pressure cooking cycle, so the jars are just for storage purposes. Can you freeze the extra half-pint jars? Can’t wait until blueberry and strawberry season next year. Once you have the jam in the jars you can process the jars in a boiling water bath, just like you would when making jam in the traditional way. When a vacuum is formed, the jam will keep for at least a year. I was wondering this then u could keep it on shelf and not fridge too? Would love to know thi s answer too. Thanks, good to know. I’ll try that with my next batch. I just made this with raspberries and mango and there is a TON of juice; when you say to boil for a while, do you mean like 5 mins or 30 mins? Hi Laura — it really depends on the fruit. I’ve let mine boil for probably 30 minutes before with peaches, because I wanted most of the water to evaporate away and leave me with a nice, thick jam. Blueberries and strawberries I don’t think took quite as long. Raspberry and mango sounds like a lovely combo! 🙂 But yes, simply let it reduce for longer. Thank you so much! Yes, I did end up boiling it for about 30 mins! I was wondering about converting the honey measurement into ounces. I know that 1 pound = 16 ounces, but since we’re dealing with a liquid (and all liquids have different densities), I’m not sure how many ounces to go with. Even a cup measurement would help, if you have that information available! a pint’s a pound, the world around…. Plum are ripe TODAY, I’m off!! Does it have to be raw honey? A pound of Honey will fill a measuring cup to the 12 oz line since honey is more dense than water (water is what the measuring cup is measured on). can we use brown sugar instead of honey? or partial of each? On the stove it takes a good 35-40 minutes of standing there stirring. Whew. The IP will make this a lot easier! I am going to do this with strawberries. Do you think I could add rhubarb to this and still safely just store it in the fridge? I did not see a reply answer to this question of adding rhubarb with strawberries and what changes if any to the recipe? Hi Jaime! Sorry for the late response. I haven’t tried this with rhubarb but I don’t think it would make any difference. 🙂 This recipe makes a small amount that’s supposed to be used up quickly, so I believe it would store just fine. How can I make this without honey? Thanks for asking – I cannot have honey and was wondering the same thing. “My Oh My!” That’s my name for the preserves I made via your recipe! Thanks! Second year of fig harvest in our new home. So many figs. Gave them away last year, couldn’t eat them all. Then, I found this recipe. I’ve never made jam, jellies, or preserves… ever. But I did today! I was so nervous that I forgot to take pic until it was done. Honey and Figs! Simple! Elegant! Delicious! I’m gonna make more in a few days… lots more! I guess I’ll freeze the extra as I don’t eat much honey and NO sugar. But it’s great to have around. I’m planning to take a jar of it to the July 4 party tomorrow! To quote others, “Food isn’t made of ingredients… it IS ingredients!” This is amazing food! Jim, always add some bottled lemon juice about 1 or 2 tablespoons per jar of fig jam being made. Figs are very acidic and can spoil. So always add some lemon juice. I also have a fig tree and get way to many. I wash and flash freeze whole figs and place in freezer bag in the freezer to use for smoothies or later jam making. I meant to say Figs are not very Acidic. Delicious. Only problem is that the extreme high heat kills all possible good nutrients of the honey and turning it to just basic sugar product. So I was hoping to use this recipe for gooseberry jam but am not entirely sure how to convert…I’m assuming 2 lbs like the blueberries but I have no idea how much gooseberries cook down. Any ideas or recommendations would be great. Also looking for how many cups would equate to the amount of honey mentioned? Thank you so much for this recipe! I am making my 2nd batch now. We have so many figs in the freezer from our tree and I really didn’t know what to do with them. I am putting it in 1/2 pint jars and giving for Christmas gifts to our neighbors and friends. It is really so good! For us, I am planning on putting over cream cheese with crackers for an appetizer. Thank you again! Haniya, What an easy and simple recipe to follow. Amazing taste with lots of balanced nutrition for the good health. Just starting my second year with this jam recipe! Figs are ripening on the tree. I get a quart or two a day for a couple weeks from my tree. This year I’ve got smaller jars to give samples as gifts to friends. I cut my figs into quarters and follow your recipe as written. Makes SUCCULENT, WONDERFUL jam from figs!!! This year I’m thinking of “jamming” some myer lemons. I’m betting it’s wonderful! Will let y’all know! You didn’t answer question after water bath and sealing jars can it then be kept on shelf instead of refrigerator? I’d like to know the answer to the water bath/storage question too. Can you half the recipe? If I don’t want to use blueberries I have to ise 2 lbs strawberries or keep same amount? I don’t have a pressure cooker. Is stove top cooking in a saucepan much different? Your recipe is my go to for making jam! It’s so simple. I’ve made blueberry, raspberry, strawberry and peach jam. I cut down on the amount of honey, our taste preference. Also, if the fruit doesn’t produce enough of it’s own pectin, I remove some of the hot liquid and mix with cornstarch and add back in and let it simmer for a few more minutes. When cooled, it’s a prefect thickness. Thank you so much! Approximately how much cornstarch do you recommend? DO YOU HAVE TO HAVE AN INSTANT POT TO MAKE THESE RECIPES? Has anyone tried making muscadine jam with this recipe? Thanks for the practical information. Our Instant pot has earned a permanent place on the countertop. It’s great to learn new recipes for the Instant Pot. Has anyone made apple jam with this recipe? I have honey that isn’t raw. Can I use this? I love blueberries, but for some reason I’ve never tried blueberry jam (sadly, I’m just a grape and strawberry person). That’s going to change thanks to this recipe. This is an interesting mixture as I never imagined using honey in a jelly recipe, but then again, I’ve never cooked jelly. I suspect the honey makes it sweet without being sickly sweet. I can’t wait to try this but I have a question. Can you use honey that has crystalized?